What's the one thing a parent can do to make the most difference in the long run? The research is clear: show up! Now the bestselling authors of The Whole-Brain Child and No-Drama Discipline explain what this means over the course of childhood. One of the very best scientific predictors for how any child turns out--in terms of happiness, academic success, leadership skills, and meaningful relationships--is whether at least one adult in their life has consistently shown up for them. In an age of scheduling demands and digital distractions, this might sound like a tall order. But as bestselling authors Daniel Siegel and Tina Payne Bryson reassuringly explain, showing up doesn't take a lot of time, energy, or money. Instead, showing up means offering a quality of presence. And it's simple to provide once you understand the four building blocks of a child's healthy development. Every child needs to feel what Siegel and Bryson call the Four S's: * Safe: We can't always insulate a child from injury or hurt feelings. But when we give a child a sense of safe harbor, she will be able to take the needed risks for growth and change. * Seen: Truly seeing a child means we pay attention to his emotions--both the positive and the negative--and strive to attune to what's happening in his mind beneath his behavior. * Soothed: Soothing isn't about providing a life of ease, but instead teaching your child how to cope when life gets hard, and showing him that you'll be there with him along the way. * Secure: When you reliably provide safety, focus on seeing her, and soothe her in times of need, she will trust in a feeling of secure attachment. And thrive! Based on the latest brain and attachment research, The Power of Showing Up shares stories, scripts, simple strategies, illustrations and tips for honoring the Four S's effectively in all kinds of situations--when our kids are struggling or when they are enjoying success; when we are consoling, disciplining, or arguing with them; and even when we are apologizing for the times we don't show up for them. Demonstrating that mistakes and missteps are reparable and that it's never too late to mend broken trust, this is a powerful guide to cultivating your child's healthy emotional landscape. 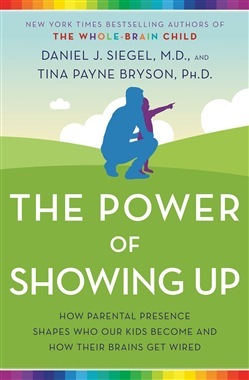 Acquista The Power of Showing Up in Epub: dopo aver letto l’ebook The Power of Showing Up di Daniel J. Siegel, Tina Payne Bryson ti invitiamo a lasciarci una Recensione qui sotto: sarà utile agli utenti che non abbiano ancora letto questo libro e che vogliano avere delle opinioni altrui. L’opinione su di un libro è molto soggettiva e per questo leggere eventuali recensioni negative non ci dovrà frenare dall’acquisto, anzi dovrà spingerci ad acquistare il libro in fretta per poter dire la nostra ed eventualmente smentire quanto commentato da altri, contribuendo ad arricchire più possibile i commenti e dare sempre più spunti di confronto al pubblico online.